Chagoury Suit says US agencies have caused great damage to his reputation and property. 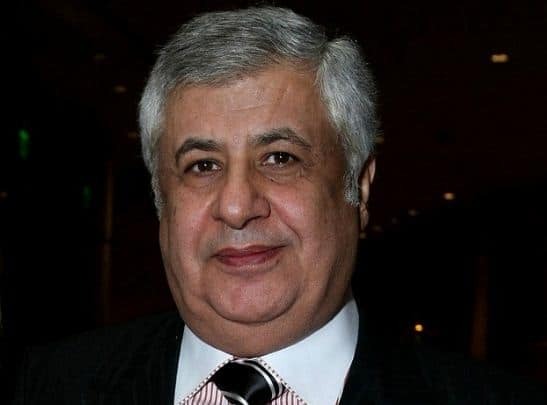 Billionaire business tycoon and owner of Eko Hotels in Lagos, Gilbert Chagoury, has filed a legal action against the US government and its agencies for Privacy Act Violations. Chagoury filed the case on Friday, which is said to be the first to be made under the Judicial Redress Act, which was signed into law by President Barack Obama in February this year. The Los Angeles Times recently reported that Chagoury, who was born in Nigeria and has dual citizenship, was barred from entering the United States and his visa request denied based on alleged links with a terrorist group. Chagoury, who is also a big donor to the Clinton Foundation and has a home in Beverly Hills, California, was denied the visa on grounds that he gave financial support to a Lebanese politician, Michael Aoun. According to the report, Aoun’s party is in political coalition with Hezbollah, tagged a terrorist organisation by the US. Hezbollah terror tag stemmed from the double bombings in 1983, killing 63 at the U.S. embassy in Beirut and 241 at a Marine barracks later that year. In the filing before the court in the District of Columbia, Chagoury contends that the information is wrong and that he was injured by the US agencies which leaked it to the media. According to a report by PRNewswire, Chagoury contends that the US agencies have caused great damage to his reputation and property, and denied his Constitutional right to due process. The defendants in the case are the FBI, the Department of Justice, the National Counter Terrorism Center, the Department of State, the Department of Homeland Security, the Central Intelligence Agency, and US Customs and Border Protection. In the filing by his lawyers, Chagoury is said to have an exceptional record of public service and demonstrated commitment to core American values such as religious freedom. His lawyer said despite Chagoury’s well-known love of the United States and his numerous, generous charitable contributions over 35 years of visiting America, he was denied a visa by the United States Department of State in 2015. “This decision was based on false information. This injustice was compounded when anonymous employees of the US Government leaked information to the media about the denial of Mr. Chagoury’s visa application, including the false information that led to the visa denial. “Because Gilbert Chagoury is a successful businessman, an influential advocate for religious freedom, a global philanthropist and a friend of prominent political leaders including many here in the United States, the LA Times published the story. Pursuant to 5 U.S.C. § 552a(b), the FBI, DOJ, NCTC, State Department, DHS, and CBP may not “disclose any record which is contained in a system of records by any means of communication to any person, or to another agency” unless certain exceptions apply. At no point in time did Mr. Chagoury provide the Government with either verbal or written consent to disclose any information or misinformation concerning him to third parties. While US citizens have long been protected by the Privacy Act, until recently, foreign nationals have not had recourse under that statute when their privacy has been violated by the US Government. The Judicial Redress Act extends those Privacy Act protections to citizens of certain other countries. Signed into law by President Barack Obama in February 2016, the Judicial Redress Act allows foreign citizens in European countries to sue the United States for unlawful disclosure of personal information under the terms of the Privacy Act. Mr. Chagoury, a citizen of the United Kingdom, is bringing the first suit under the Judicial Redress Act. “All of my life, from when I was a boy in Nigeria, I have loved America because it was the land of freedom and justice,” Chagoury said. “The lawyers said the intentional leak to the media of false information about Mr. Chagoury was a repeat of a similar unlawful incident from 2010, when he was wrongly placed on the no-fly list, without notice or opportunity to be heard, and his placement on the no-fly list was leaked to the media. When challenged with facts, the U.S. Government reversed that decision, formally apologized and allowed him to travel to the United States, which he did multiple times without incident until recently. As an important industrialist in Nigeria, and an ambassador to the Holy See and UNESCO, Chagoury has assisted the U.S. whenever possible, and U.S. Ambassadors and officials often call him to help solve their problems. The Chagourys have been coming to Los Angeles for over 35 years. They frequently visit family members who are United States citizens and live in the United States. Their love of America has led the Chagourys to give generously to several American charitable organizations including St. Jude’s Children’s Research Hospital and the Beverly Hills 9-11 Memorial. Following a WikiLeaks publication, Chagoury’s name has also been an issue in Hillary Clinton campaign for US presidency, with Donald Trump, among others, using his link with the Clinton Foundation to accuse the Clintons of offering favours to the businessman. The businessman’s trouble with American security officials began in 2010, when he was pulled off a private jet in Teterboro, New Jersey, and questioned by Homeland Security officials for four hours because his name was now on the no-fly list within the United States. Chagoury later received a letter that said his name was taken off the list and he was now considered a ‘selectee,’ meaning he was allowed to fly, but would receive extra scrutiny. Chagoury’s name was later added to a database used to screen passengers for terror links, a linkage he has denied. Chagoury was born in 1946 in Nigeria to Lebanese parents, but was educated at the Collège des Frères in Lebanon. He is married to Rose-Marie Chamchoum,also a Lebanese with links to Niger Republic. The couple has four children, Ramez, Gilbert-Antoine, Christopher and Anne-Marie.